Cut tofu into 8 pieces widthwise; then cut each piece diagonally to make 2 long triangles. Pour milk in a shallow bowl; add corn starch and whisk with a fork to combine. 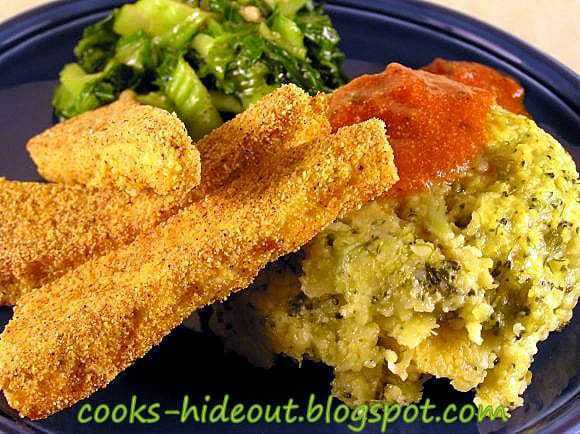 In another shallow bowl, add all the ingredients for the cornmeal crust and mix well. Pour oil to about ¼“ in a skillet and heat until very hot, but not smoking. With your left hand dunk tofu in milk, roll it around and drop it into the cornmeal mixture. Now with your right hand, roll it around and make sure all sides are uniformly coated. Slowly place in the hot oil. Repeat with rest of the tofu pieces. Cook them in two batches to make sure that the skillet is not over crowded. Cook for 3 minutes on one side, flip with tongs and cook for another 2 minutes. Your nose would know when the time’s up. Drain on paper towels and serve warm over broccoli polenta.